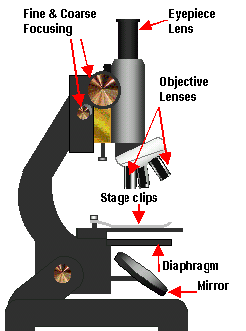 Dissecting microscope is another name for simple microscope. It is very important laboratory equipment, it is often used in biology experiments. While we are using simple microscope, one should follow these precautions. 2. Proper maintenance should be taken that is this microscope should be kept in case when not in use. 3. There are two mirrors used in it, one is plane mirror and it is used for natural day light and another mirror concave mirror for artificial light. - to keep the slide, there is a glass stage. - Plano-concave mirror is used for light adjustment. Main aim of the apparatus is to view the object to be examined, clearly. Take the object or material to be examined on the glass stage, add a drop of glycerin, cover with a cover slip, adjust the mirror for light and then view the object or material through eye piece.